It's countdown time once again and we know that most of you guys are excited to see if your favorite Television Program made it to to the Top 15 of our list. 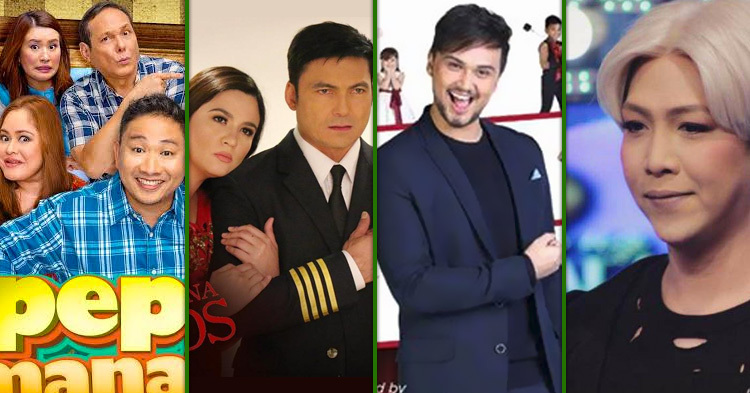 Whether you're a Kapuso, Kapamilya or Kapatid, we know that what really matters most is that the Filipino people are entertained by the following shows. Michael V., Gabby Concepcion and Sunshine Dizon, Vice Ganda and Billy Crawford. Let's start with the weekend list! Kapuso Mo Jessica Soho replaced Daig Kayo Ng Lola Ko in AGB weekend's top spot, while Wansapantaym remained Kantar's leader. FPJ's Ang Probinsyano, on the other hand, is still unmatched on Weekdays. This is based on the latest TV rating numbers for December 11 - 17, 2017. Kapuso Mo Jessica Soho took the top spot on AGB's weekend ranking dismantling previous week's leader Daig Kayo ng Lola Ko. KMJS scored 9.6% to top the ratings board followed by Pepito Manaloto with 9.2 and MMK on third with 8.2%. KMJS, on the other hand, placed 5th overall for the week following TV Patrol in 4th with 9.8%, 24 Oras in 2rd with 9.9%, La Luna Sangre in 2nd with 10.4% and Ang Probinsyano on top with 12.1%. Meanwhile, AGB's weekday list is almost the same with Ang Probinsyano, La Luna Sangre, 24 Oras and TV Patrol taking the 1st 4 spots with same figures as above and Super Maam taking the 5th spot with 9.2%. For Kantar, rankings didn't change as Wansapanataym defended its throne with 25.4%. Runners-up were also in their same position as Little Big Shots, MMK, Home Sweetie Home, and Goin Bulilit took the 2nd to 5th spots with 25.0%, 24.6%, 22.2%, and 21.7% respectively. And just like AGB, Kantar's weekdays and overall rankings are also led by Ang Probinsyano. Ang Probinsyano scored 40.2% in Kantar to remain on its leadership post. Meanwhile, here are the lists of AGB Nielsen and Kantar Media rankings for December 11 - 17, 2017.